My chow puppy Simba is constantly panting since we got him a month and half ago. He even breathes heavily when he's asleepy. 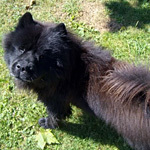 I understand chows are very hot natured but sometimes he pants sooo hard I'm just afraid he's going to have a heart attack or something. I keep the house pretty cool and always always have water bowls everywhere for him. Is this normal? ( my husband took him to the vet for shots and they didn't find anything unusual). I'm just a little concerned..
Dont worry about it, particularly if you have had him vet checked and no problems. Panting can be a sign of anxiety, thirst, or heat. 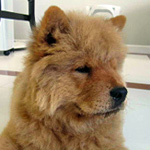 And in thick, short muzzled Chows, it can just be them growing into their bodies. The panting is fine. I wouldnt worry too much about it. You can tell anxiety panting from regular panting by the speed of it. A slow relaxed pant is just that-relaxed. A heavy but slow pant is heat. A quick pant, sometimes accompanied by a little whine is anxiety. Leahsierra, I feel your pain! I don't think I could bear to listen to him do that all day. I would go mad. I would definitely want to know what's causing his excessive panting. Is it hot where you live? After exercise it can take them a long time to calm down, but eventually they will. You're right, the heart is a possible factor here. Maybe you will have to have a heart ultrasound done, after you've ruled out all other possible reasons for his panting. Is his face very squished in? Maybe you have a photo for us? You have to watch for tell tale signs of further weakness or fatigue. I haven't seen constant panting in my Chow pup. But she snores when she is sleeping sometimes. Or grunts. I won't say it is normal if its constant all day. I'm new here but replying to an old post. I'm wondering if anyone can help me. I have an (almost) 9 week old chow chow puppy. He has been vet checked by the breeders vet and is due to see mine in a few days. We have had him since he was 8 weeks old. He is really settled, playful etc but he is constantly panting. Even when he is asleep. I was wondering if he was just over tired but didn't know if this was a symptom or I'm just over-thinking it. Any help and advice will be gratefully received!